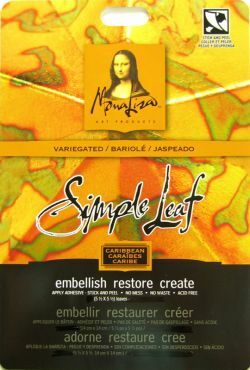 Varigated Simple Leaf Caribbean, imitation metal leafing, comes attached to a waxy paper so handling is easy with no fly away leafing flakes. Best for flatter surfaces. Use Extra Thick Leafing Adhesive thinned to the consisitency of melted ice cream for use as an adhesive for the Simple Leaf. Apply with a sponge brush as the leafing will pick up any ridges left by the adhesive. Allow the adhesive to dry until tacky to the touch. You can wait a week or so before applying the leafing the the adhesive as it will remian tacky but you must allow the adhesive to become takcy as the the leafing will not stick if the adhesive has not set to the tacky stage.